The Jaina tradition is that Mahavira (mahāvīra) himself had come to the north-eastern borders of Andhra Pradesh and preached the religion. There is a tradition (represented in Pariśiṣṭaparvan of Hemachandra) that Samprati, the grandson of Asoka (aśoka), sent Jaina monks to Andhra in the capacity as his ambassadors, after instructing the people how to treat them. The Hāthīgumphā inscription of Kharavela (kharavēla), written in Mauryan year 165 (2nd century B.C. ), says that the idol of the Jina, which belonged to Kaliṅga taken by King Nanda of Magadha, was regained and brought back. It also says that King Kharavela got constructed monasteries for the Jaina monks. These references show, that by the 3rd century B.C. there were organized Jaina movements in the Kaliṅga-side of Andhra Pradesh. After this, Jainism might have got a boost during the time of Simuka, the first of the Satavahanas (śātavāhana). But Simuka is more like a puranic, not a historic, figure, so that we may not be definite about the facts regarding his Jaina leanings. It is reported that early Satavahana coins were recovered from a Jaina cave in Kapparao-pet in Karimnagar district of Andhra Pradesh. Some scholars prefer to think that the presence of the coins in a Jaina institution, shows that the Satavahana kings, at least some of them, were helping Jaina monks. One of the Satavahanas, whose capital was Pratiṣṭhāna, is said to have requested a Jaina pontiff to postpone his religious discourses so that he also might be able to attend. It is thus clear that by the time of the Satavahana rule, the Jainas established themselves at Paithan and spread from there. 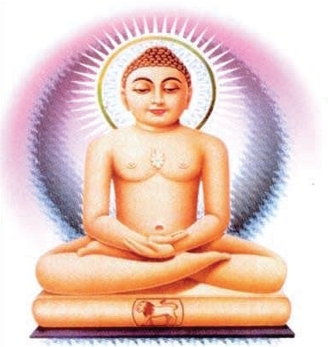 Kundakunda acharya (kunda-kunda ācārya) (c. 1st century A.D.) is one of the greatest savants of South Indian Jainism. According to tradition, he belonged to the hill-tracts of Anantapur. According to another tradition, Simha-nandi, a Jaina monk, who lived in Pēr-ūr in Andhra Pradesh, helped two Ikṣvāku princes, Dāḍiga and Mādhava, to carve a kingdom of their own, which later came to be known as the Ganga (gaṅga) kingdom. The fact that the sages hail from Andhra region, show that Jainism was flourishing in that country during the early centuries of the Christian era. Jainism had its hey-day during the reign of the Rashtrakutas (rāṣṭrakūṭa) (A.D. 700-1000). This assumption is supported by literary and epigraphical evidences. The Rashtrakutas had their capital in Mālkhēd (Manyakheta; mānyakheṭa); they had jurisdiction over many parts of Andhra. During the Rashtrakuta period, art and literature flourished and Jaina contribution was considerable. Amōgha-varṣa or Nṛpatuṅga (A.D. 814-78), himself, was a great scholar and promoted scholarship. He died as a Jaina. The Ellora caves were sculptured during the Rashtrakuta period and there are five Jaina shrines in this complex. Rashtrakuta generals like Bankeya (baṅkeya), Srivijaya (śrīvijaya), Nara-simha etc., were Jainas by religious persuasion, and contributed much to the promotion of the religion. From an inscription in Hemavati (hēmāvatī) in Anantapur district, it is understood that Bankeya's son, Kundate, died observing samnyasana. It was during the period of Indra III (A.D. 915-27) that Danavula-padu (dānavula-pāḍu), in Cuddappah, in Nizamabad district, rose into prominence. 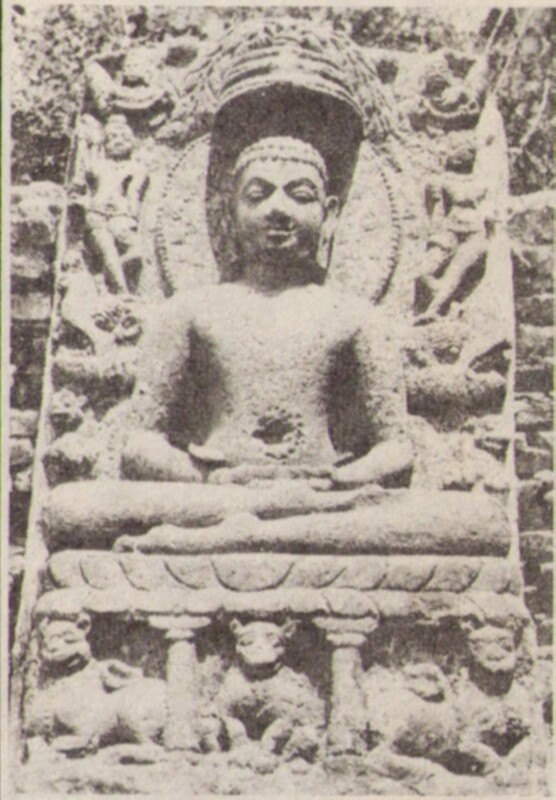 Pōdana of ancient times (modern Bōdhan) also was a Jaina centre. Even now, a large number of Jaina vestiges are found in this place. Abundant epigraphical records also were collected from here. In a chamber of bricks, an image of Parsvanatha (pārśvanātha) was enshrined here. 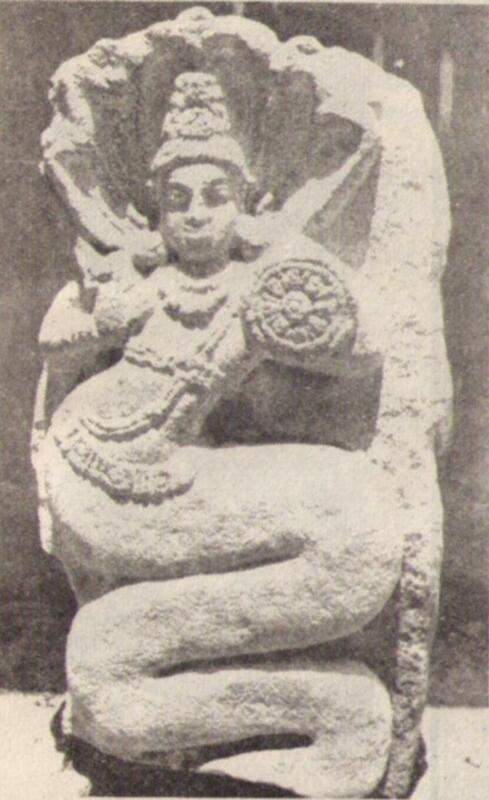 From one of the inscriptions, it is understood that Srivijaya, a Rashtrakuta general, died observing samnyasana. The inscriptions reveal that people from distant places used to come to Danavula-padu to obtain samādhi-maraṇa. In the court of Krishna III (A.D. 939-66), there were Jaina scholars who hailed from various places of Andhra Pradesh. Ponna, the celebrated poet of his time, is supposed to have gone to Manyakheta, from Puṅgan-ūr in Guntur district. Indra IV, the last king of the Rashtrakuta dynasty, is said to have obtained death by samnyasana. His maternal uncle, who, along with the monarch had embraced Jainism, died in A.D. 975, seven years earlier than his nephew. It may be presumed that the gospel of ahimsā, in its extreme form, was not intended for laymen, but only for the monks and nuns, since the Rashtrakuta rulers and their generals had continuously indulged in sanguinary and belligerent exploits. The Eastern Chalukyas (cāḷukya; A.D. 624-1461), feudatories of Rashtrakutas, ruled over their kingdom from Vengi (veṅgi). By persuasion, most of them were Hindus, but they were tolerant or even promoters of Jainism as well. Ayyaṇa Mahā-dēvī, the queen founder of the Eastern Chalukya lineage and mother of Kubja Viṣṇu-vardhana (A.D. 624-41), herself, got constructed a Jaina temple in Bezwada. The Jaina centre, Rāma-tīrtha, in Vijaya-nagara of Andhra Pradesh, flourished during the time of Vishnu-vardhana IV (A.D. 772-818). Amma II was the greatest benefactor of Jainism among the Chalukyas of Vengi. Though he seems to have been a Hindu by faith, ardent in the promotion of that religion, he was equally zealous in helping the growth of Jainism. His governor, Kaṭaka-rāja Durga-rāja, got constructed the Kaṭakābharaṇa-Jinālaya, to which this official made the grant of a village. His Kaḷuccam-burru grant mentions the gift of a village to a Jaina temple. His Masūlipaṭṭaṇam plates record the grant of Pedagadelavarru to the Jaina establishments at Bezwada, at the request of his generals, Bhīma and Nara-vāhana. 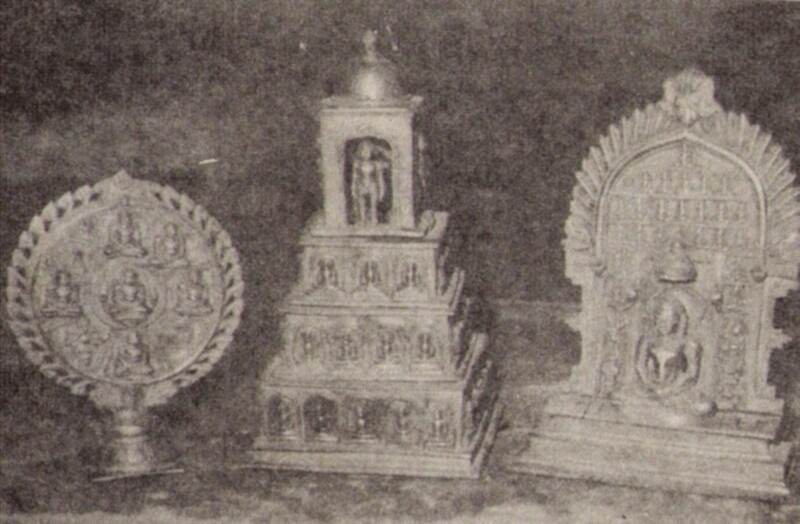 The Chalukyas of Vemula-vada (vēmula-vāḍa), who were vassals of the Rashtrakutas, also promoted Jainism in their regions. Ari-kesari II (ari-kēsari; A.D. 930-55) was perhaps the most remarkable king of this lineage. He was the patron of Pampa, the first great poet of Kannada. Some details about this poet can be obtained from the Kurkyal (kurkyāl) inscription. It states that Pampa's brother got constructed the Tri-bhuvana-tilaka Jaina temple and erected the images of all the 24 Tirthankaras (tīrthaṅkara) along with that of the Yakshi (yakṣī) Cakrēśvarī on Bommalaguṭṭa in Kurkyal village of Karim-nagar district. The label 'Pampa', found on a memorial stone in this place, tempts local people to claim it as the niṣidhi (memorial stone) of the poet Pampa. Fig. 5. Mahavir image on Sangamayyya-konda, Kollivalasa (Srikakulam District). 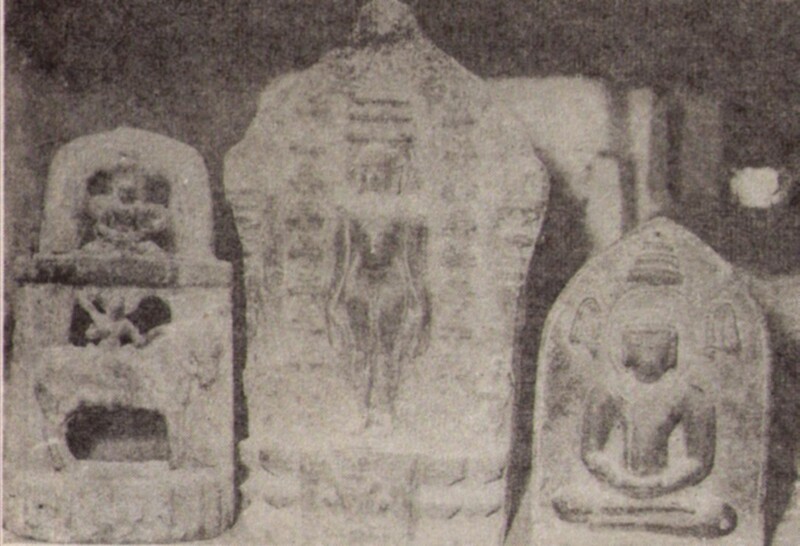 Beddega had strong leanings towards Jainism. 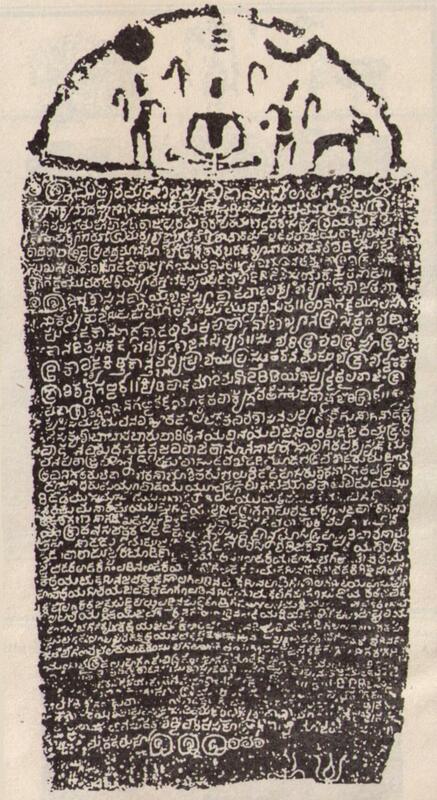 An inscription in Vemula-vada mentions that Beddega gave the Subha-dharma (śubha-dharma) Jaina temple to his teacher, Soma-deva-suri (sōma-dēva-sūri), and supported the institution by the grant of the village of Venikalupulu (vēnikaṭupulu). 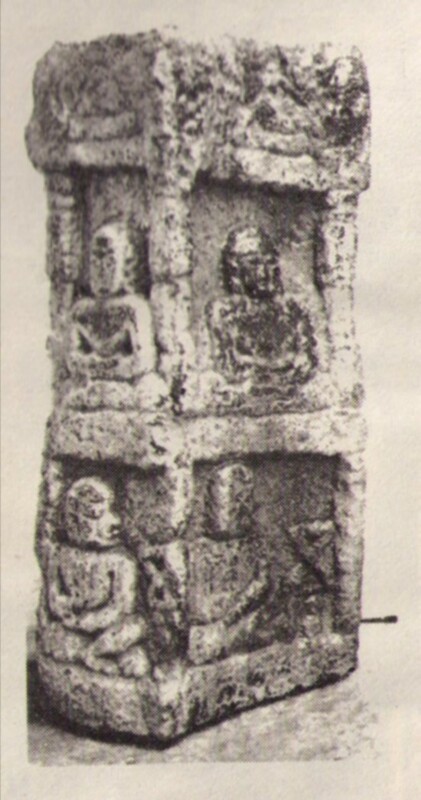 This Soma-deva-suri belonged to the Cauḷa-saṅgha. This shows that there was organized asceticism by this time in Andhra. Ari-kesari III also was a Jaina. In his Parbhani plates, Ari-kesari states that he had granted the village of Kuttam-vritti-venikatupulu for maintenance of Subha-dharma-Jinalaya, which was constructed by his father. Many of the feudatories of the Rashtrakutas were Jainas. The Halaharavi inscription (A.D. 930) says that Caṇḍiyabbe, wife of Kannara, a feudatory of Gōvinda IV (A.D. 930-35), caused the basadi in Nandavora to be constructed and made an endowment in the form of land and money for the temple.